The values in the Category and Subcategory fields are visible to learners in the list of discussion topics on the Discussion page. When you add a content-specific discussion topic to a unit, learners see only the Show Discussion and New Post options. EdX recommends that you add an HTML component before each discussion component to introduce the topic that you want learners to discuss. Learners must select Show Discussion to expand the discussion space and read the contributions, or select New Post to post their own contributions. 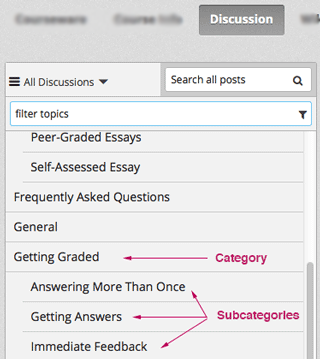 On the Discussion page, learners can find the category and subcategory of the discussion in the discussion thread list.